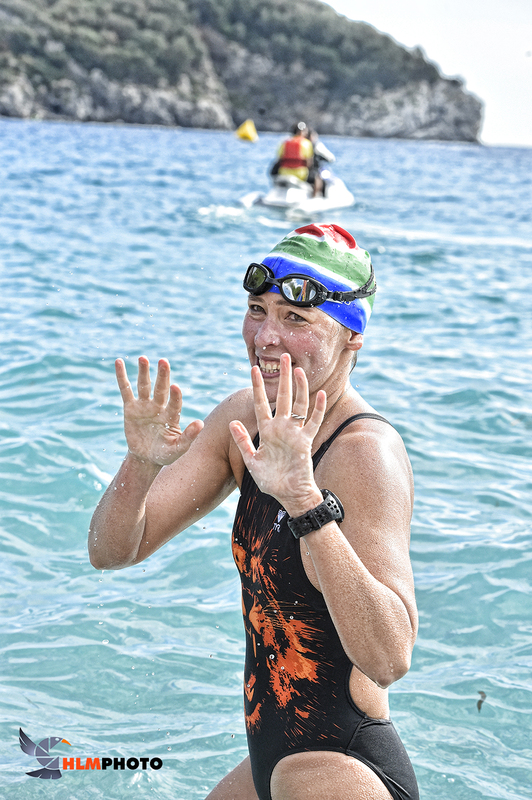 Carina Bruwer – South African marathon swimming veteran and lead player of multiple award-winning instrumental pop group Sterling EQ – made waves in Italy this week when she completed an epic 21km solo swim for charity, following on from Sterling EQ’s debut performance in Italy the night before. The solo swim was a special feature at the annual SwimTheIsland race in Bergeggi in the province of Liguria – one of Europe’s largest open water events with over 2000 swimmers competing in distances ranging from 800m to 6km. Carina, who was invited as an international celebrity to endorse the race for the second year, aimed to complete 18km by swimming multiple laps of the race route, to raise funds for the Little Fighters Cancer Trust, the South African charity that is the sole beneficiary of her “Swim For Hope” project. When she had finished 18km, she announced to the excited crowd that she would swim an extra lap to raise additional funds, despite having suffered multiple jellyfish stings. She ultimately completed 21km in a time of 6h25’58. “I felt great after 18km and I knew that I would have the crowd’s attention when I came out, as this was going to be the end of my swim. As they were cheering and the presenter started to interview me, I suggested swimming another lap, for the little fighters in South Africa. The crowd went crazy and started donating Euros there and then. 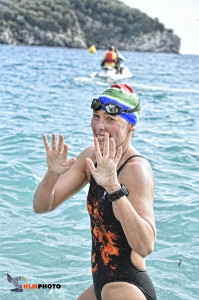 I swam an extra 3km to reach a total distance of 21km, and could hear the cheers from a distance as I approached the finish – it was amazing, and it certainly numbed the pain from the more than 20 jellyfish stings!”, said Carina, who was awarded il Golgo dell’ Isola’s “symbolic honorary citizenship” by the Mayors of Spotorno during the post-event award ceremony. Having made an indelible mark on the marathon swimming record books through many daring and record-breaking swimming feats since 2002 (most notable swims include the 36km English Channel crossing, 35km across False Bay, and a world record breaking Gibraltar Straits crossing), Carina took a break from open water swimming when she started a family in 2008. She returned in 2013 with her first “Swim For Hope”, which was a dramatic rounding of Cape Point in support of the Little Fighters Cancer Trust (LFCT). Ever since, she swims exclusively for this organization, which supports children with cancer and their families. Since 2013, Swim For Hope has raised over R250,000 as well as valuable exposure for LFCT. 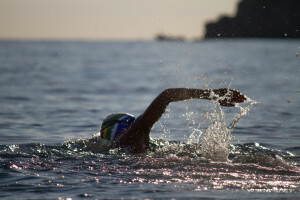 The Bergeggi swim has raised nearly R20,000 so far and donations are still welcomed on justgiving.com. Monies raised through this particular swim will go towards the organisation’s Christmas Elves Project, through which they provide a Christmas Gift to every paediatric oncology patient on 15 hospital’s patient lists across South Africa. This amounts to approximately 2 000 children with cancer. They will also aim to buy groceries for struggling families affected by child cancer, as well as gifts for the siblings who often feel abandoned due to the crippling effect which child cancer has on the family. Carina Bruwer is an acclaimed Classically trained-turned contermporary flautist and founder of Sterling EQ. As a swimmer, she competed in 7 countries between 2004 and 2006, breaking nearly a dozen records (national and international), winning numerous races, and enjoying significant media coverage, highlights of which includes being one of Cosmopolitan’s Awesome Woman 2005, one of Glamour’s “Women We Love” 2005, and Sports Illustrated’s “Top 10 Beauties of Sport”, plus an international insert on Gillette World Sport. She will feature on CNN’s “African Voices” during November. Swim the Island is part of the World Open Water Swimming Series and takes place in the fascinating Marine Protected Area of Bergeggi, in the north-west coast of Italy. Now in its 5th year, the event has become the biggest of its sort in Europe. Carina was invited by organizers BeWater, to endorse the race as international celebrity, with her ultra distance efforts enjoying extensive coverage in media and at the event. 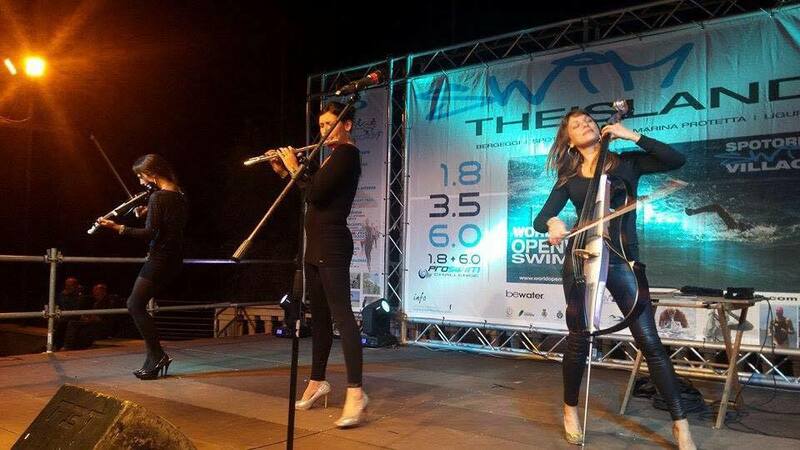 Sterling EQ is a South African instrumental pop group lead by Carina Bruwer on flute, with Luca Hart on electric violin and Ariella Caira on electric cello. 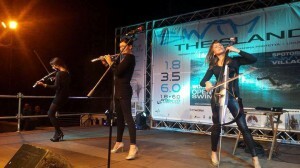 The three-piece has performed over 900 shows in 12 countries, released 3 albums and a live DVD, and won 3 major music awards, most notably a 2011 South Afircan Music Award. The Little Fighters Cancer Trust supports children diagnosed with cancer and their families, by offering wide variety of individualized assistance, including, but not restricted to, provision of food and groceries, transport, clothing, furnishings, bedding, medication, medical equipment and 24 hour emotional support. Parents of diagnosed children often lose or leave their jobs to be able to provide the special care and support required, which, together with the huge emotional strain of having a terminally sick child, often disables the family financially and emotionally. Little Fighters steps in to help create a support system in order for the children and their families to maintain their dignity, and with it, provide hope.